The mass of the initial rocky core determines whether the final planet is potentially habitable. On the top row of the diagram, the core has a mass of more than 1.5 times that of the Earth. 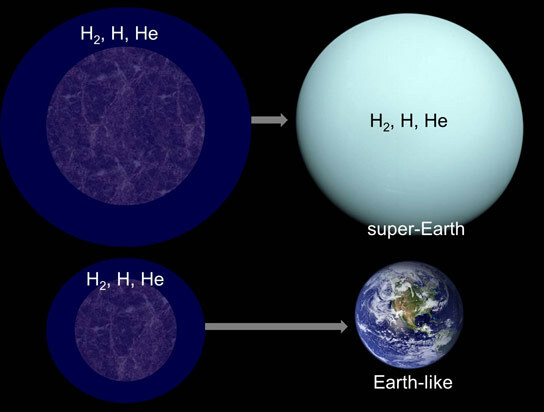 The result is that it holds on to a thick atmosphere of hydrogen (H), deuterium (H2) and helium (He). The lower row shows the evolution of a smaller mass core, between 0.5 and 1.5 times the mass of the Earth. It holds on to far less of the lighter gases, making it much more likely to develop an atmosphere suitable for life. Credit: NASA / H. Lammer. A newly published study reveals that many of the super-Earth planets discovered in the last twenty years may have captured the equivalent of between 100 and 1000 times the hydrogen in the Earth’s oceans, but may only lose a few percent of it over their lifetime, making it almost impossible for life as we know it to exist. In the last 20 years the search for Earth-like planets around other stars has accelerated, with the launch of missions like the Kepler space telescope. Using these and observatories on the ground, astronomers have found numerous worlds that at first sight have similarities with the Earth. A few of these are even in the ‘habitable zone’ where the temperature is just right for water to be in liquid form and so are prime targets in the search for life elsewhere in the universe. Now a team of scientists have looked at how these worlds form and suggest that many of them may be a lot less clement than was thought. They find that planets that form from less massive cores can become benign habitats for life, whereas the larger objects instead end up as ‘mini-Neptunes’ with thick atmospheres and probably stay sterile. The researchers, led by Dr. Helmut Lammer of the Space Research Institute (IWF) of the Austrian Academy of Sciences, publish their results in Monthly Notices of the Royal Astronomical Society. Planetary systems, including our own Solar system, are thought to form from hydrogen, helium and heavier elements that orbit their parent stars in a so-called protoplanetary disk. Dust and rocky material is thought to clump together over time, eventually forming rocky cores that go on to be planets. The gravity of these cores attracts hydrogen from the disk around them, some of which is stripped away by the ultraviolet light of the young star they orbit. Dr. Lammer and his team modeled the balance of capture and removal of hydrogen for planetary cores between 0.1 and 5 times the mass of the Earth, located in the habitable zone of a Sun-like star. In their model, they found that protoplanets with the same density of the Earth, but less than 0.5 times its mass will not capture much gas from the disk. Depending on the disk and assuming that the young star is much brighter in ultraviolet light than the Sun is today, planetary cores with a similar mass to the Earth can capture but also lose their enveloping hydrogen. But the highest mass cores, similar to the ‘super Earths’ found around many stars, hold on to almost all of their hydrogen. These planets end up as ‘mini Neptunes’ with far thicker atmospheres than our home planet. The results suggest that for some of the recently discovered super-Earths, such as Kepler-62e and -62f, being in the habitable zone is not enough to make them habitats. The ongoing discovery of low (average) density super-Earths supports the results of the study. Scientists will need to look even harder to find places where life could be found, setting a challenge for astronomers using the giant telescopes that will come into use in the next decade. The study was carried out by researchers within the Austrian FWF Research Network “Pathways to Habitability”. 5 Comments on "Study Reveals It’s Almost Impossible for Life to Exist on ‘Super-Earths’"
Maybe these super earths may have earth to mars size moons that are habitable orbiting them. Do not see why life could not exist in a high pressure environment. It could still go on. But when it came time to build a spaceship, their job would be very very difficult. It is true that very high pressure on planets are a deterrent for life formation -Higher the pressure like Jupiter or Saturn, the gravity would be more and big size of the creatures are completely ruled out in addition to finding food for themselves. Planet requires an optimal size for living. Thank You. Your graphic and caption are incorrect. Deuterium is ^2H, not H_2. H_2 is diatomic hydrogen. Studies are 99% based on thin air, assuming that “life” can exist only based on human habitable zone. Earth is unique in its own way, as are other planets where life can exist. The build is based on local environments and we all know, life always finds a way to exist. Complex life forms as well as simple life forms. Because we don’t understand the universe yet doesn’t mean that we must box in the possibilities.